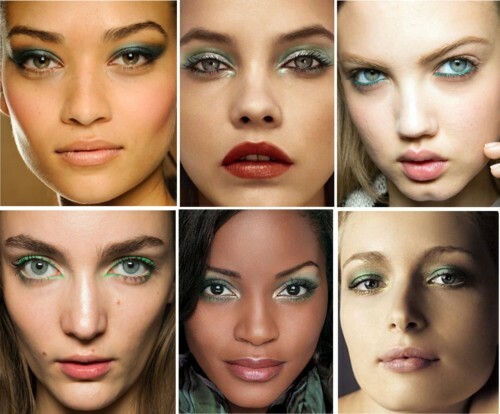 In honor of St Patrick's Day, we wanted to give you tips and tricks for wearing green eye makeup. Most of us probably shy away from this look because when you think green, you might picture something like the Wicked Witch. With our tips, you'll look flawless, not frightening. A little goes a long way. Moderation will keep your look clean and attractive, and you can always add more if you want to make a bolder statement. Keep the rest of your look simple. For example, use a light lip shade with a bold green look. If you're wearing a lighter green shade, then you can try a darker lip shade. Try a shade that compliments your skin tone. If you're fair-skinned, opt for lighter shades of green. Darker, more vivid shades will complement darker skin tones. Some really dark shades of green will almost appear black, so you can substitute it for your smokey eye shades or everyday black liner. Apply your eye makeup first - for two reasons. One - if it flakes off onto your face, you can easily clean up before applying your foundation. Two - a full face of makeup can look overdone with this bold eye look. Once you've applied your eye makeup, you'll be able to see if you really need a full application of foundation, or just some concealer to freshen up your complexion. Don't be afraid to experiment with your look! An all over wash of green eyeshadow is beautiful, but you can also add intrigue to your look with a pop of eyeliner either on the top or bottom or just at the corners of eyes. We love to apply a dark green liner and then smudge it for a sultry look. Mix and match shades to find the color that looks best on you. Pur Minerals Perfect Fit Eye Shadow Trio - Lady Luck: The colors in this trio really complement each other and the neutral shades are great for everyday wear. gloMinerals gloEye Shadow Trio - Fresh Greens: This pretty little palette features a light and dark green shade with a neutral base color. Pur Minerals Eye Defining Pencil with Smudger - Peridot: Even the name sounds pretty! With a built-in smudger, this liner is our go-to green. blinc Mascara - Dark Green: Our just for fun pick. It's also water-resistant, won't smudge, clump or flake. Colorescience Pro Loose Mineral Eyeshadow Shimmer - Green: The khaki-green shade is flattering, while the built in applicator is convenient. Follow our blog to get makeup tips and tricks delivered straight to your inbox!